He’s done keeping his story straight. 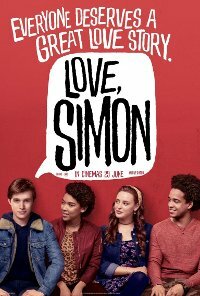 This well-rated offbeat romance is a coming-of-age tale about the titular teenage boy, Simon, who goes through a different kind of Romeo and Juliet story. He has a love connection with a boy, Blue, by email, but the only problem is that Simon has no idea who he’s talking to. Simon must discover who Blue is... and along the way, he tries to find himself. Nick Robinson, Jennifer Garner, Josh Duhamel, Kathering Langford, Alexandra Shipp, Logan Miller, Leiynan Lonsdale, Jorge Lendeborg Jr. Prejudice Low, very infrequent with a strong anti-prejudice message. Contains low-impact homophobic teasing with 13 year disapproved of.